The other day, I posted some thoughts on why I bought more shares of XFML after the stock plummeted to below $7. I didn’t apply any *technical analysis* or anything like that before making the trade and my reason was quite simple: nothing really changed before and after the sell off and the price became very attractive at that time. And I hope any rebound could help me cut my losses. never, never add to a losing trade. Don’t get stuck on the old “buy low, sell high�? maxim. An equally worthy objective is to buy high and sell higher. The problem with “buy high, sell higher�? is that you don’t know when or if something will be going higher after you buy it. You can analyze it all you want and apply several sets of criteria, but the bottom line is that the market is fickle and no one can predict with certainty and accuracy that any one stock will continue to grow. Same investor now tries the “buy high, sell even higher�? approach, buys 10 shares at $10 per share of stock Y. The stock then rises to $15 per share. He figures that the stock will go higher so he can afford to “buy high�? and buys 10 more shares. He now has invested $250. Let’s say he is right and the stock goes to $20 a share. He sells all and gets $400 for a profit of $150. Sounds pretty good right? If he is wrong though and the stock becomes worthless, he lost $250 ($100 more than the buy low sell high strategy). Some of the greatest investors like Benjamin Graham, Warren Buffett, Bill Miller, and others have all advocated the “Buy Low, Sell High�? approach, but who advocates the “Buy high, sell higher�?? The guys on CNBC’s Fast Money…. and that is not a good thing (if it works so well, they would all be billionaires). Besides XFML, I had another experience with a “losing” stock and it is Nortel (NT), the stock that I have bought multiple times and never got out of the hole. I first bought 1000 shares at $6.67 (before the 10:1 reverse split) in January 2004 when the stock was climbing. Shortly after that, the stock dropped like a rock. Then in May, using the same thoughts with XFML, I bought some more at $3.97/share and more five months later at $3.27 a piece. Today the stock is traded around $25.64 (equals to $2.56 before the 10:1 reverse split) and I have no plan to add any more since I feel Nortel has much bigger problem than XFML does. So what would you do if the stock you recently bought lost 50% of its value in a matter of weeks? Get out before it’s too late or add more and hope for a rebound? My approach is pretty simple – put a stop order at 20% below my purchase price. I borrowed that approach from the investment company I work for, and it seems to me it’s a simple, straightforward method of cutting your losses short and focusing on the big gains. never buy a stock without a stop loss. i always put a stop loss base on the previous swing low. As has been said, a stop loss order. Preferably a trailing stop so you can somewhat protect any gains that DO occur. Do you still stand the chance of losing money? Of course…you have to pick some percentage below the current price, and without a reasonably sized gap, you risk triggering a sell just because the market has a blip. But 50%? Yeah…my stop loss on just about any stock or etf in the world would be less than that. You won’t have this problem if you don’t buy individual stocks in the first place. Stick with mutual funds and ETFs. It depends on the fundamentals. Why did the stock drop 50% in a day? Is this news being overreacted to? If the fundamentals are still there, especially if it has a high return on invested capital… I’d buy more. You will always get an argument on both sides that seem logical since the answer is “depends” as the market is so unpredictible. I think if the sector is still in favor and the market is going up, the buy high, sell higher scheme works better. The buy low, sell high works well for a stock that just plummeted and you can pinpoint the reason why it did. Of course you then have to totally dis-agree with that reason, otherwise, you might get burned really bad since some stocks can go lower, and lower, and lower day by day until you lose so much money it doesn’t matter if you sell it or not at that point. Thanks for everybody’s comments. I agree that a stop lose can limit the damage, but what if the drop has nothing to do with the business the company is running? If the drop is temporary, do you have plan to buy it back if the price dropped to a level that you think it’s very attractive and could rebound once the cloud is cleared? The stock price can be driven by lots of random events, and if the sell is just based on whether a pre-set threshold is reached, you may miss a good buying opportunity if you still feel the stock has values. In many cases, the lose is temporary. nobody knows exactly what price is considered “low” and what price is seen as “high.” There are many random events that can affect the stock price either way very quickly without any fundamental changes at the company. In these cases, applying any analysis probably won’t help because the stock doesn’t really follow any patterns that can be explain by analysis. For me, I will keep the stock even if I gain more than 20% if I feel it has potentials to go even higher. I think the stop loss is a great idea (even though I have never used it). The stop loss helps keep one disciplined, which is the most important thing a stock trader needs. The stop loss is totally independent of whether you will buy a stock back or whether you think it will go up or down the next day. It is just so you don’t get stubborn. Once the stock is out of your portfolio, you can always re-assess whether or not it is worth owning. It helps clear your mind sort of speak. MoneyNing: I have never used stop loss in any trading so far. I usually hold the stocks for quite long and let them go through the ups and downs. But now I may want to try the idea with some “play” money and see how it works. I think ultimately, you need to separate your investments with your trading. You do all the stop-loss, trailing stop, limit buy etc etc with your trading. If you are in it for the very long term, buy and hold etc, then focus on buying companies that can grow long term. That’s a good plan. Good luck! I’d like to see more reviews of Zecco since I have been wanting to make one. 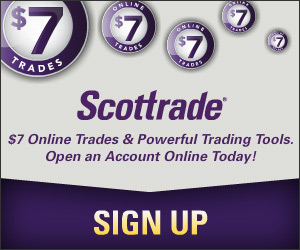 I love my eTrade account though since there is no paperwork and administrative stuff are very efficient and well thoughout (easy through the website UI). but ALWAYS study the fundamental of the stock even though you’re die-hard fan of technical analysis … warren can’t be wrong after decades in fundamental analysis, can he?